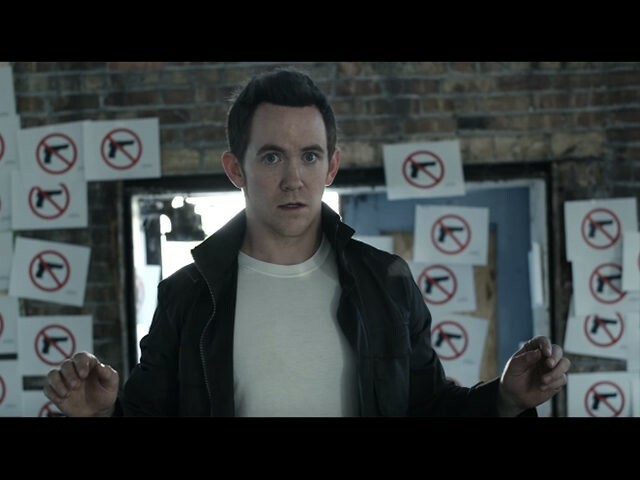 Gun Owners of America has teamed up with production company Reel Clef to release the short film Praesidium, a film that powerfully highlights the dangers of gun-free zones and the need for armed self-defense. The film, directed by Reel Clef’s Paul Myzia, opens with a man running down a street in desperation. The street is lined with abandoned buildings and the man turns and runs into one, as suspense builds. Inside, on a concrete floor, lies a beautiful woman who has been shot dead. The man is frustrated. He walks to a far wall, finds a “no guns allowed” sign and places it on the outside of the building. He then uses a device that turns back time and he appears again as at first, running down the street between abandoned buildings. He turns and runs past the sign to get into the building, only to find the woman on the floor, still dead. He goes to the basement, finds spray paint, goes outside and paints a large “no guns allowed” emblem on the outside of the building. When he turns back time to see if his actions have prevented the woman’s murder, he is distraught to learn that they have not. The man then grabs hundreds of signs and literally blankets the walls with them. He turns back time and appears as at first, running down the street between abandoned buildings. Again, the woman remains dead. The man pulls out a semiautomatic handgun and chambers a round. He places the gun next to the woman and turns back time. Just as he gets close to the building, he hears gunshots. He darts inside the building to see the woman standing, handgun in hand, and her attacker lying lifeless on the ground. In a brief interview with Breitbart News, director Paul Myzia said that short films often have the power to illuminate arguments more effectively than long-form essays or political punditry. In August 2015, Breitbart News published an overview of eight high-profile attacks in gun-free zones. Those were Virginia Tech (April 2007), Fort Hood (November 2009), Aurora movie theater (July 2012), Sandy Hook Elementary School (December 2012), DC Navy Yard (September 2013), Fort Hood (April 2014), Chattanooga military offices (July 2015), and Lafayette Grand Theatre (July 2015). In those eight attacks alone, 105 lives were lost, and more than 150 others were injured. If we add more recent high-profile attacks in gun-free zones — Umpqua Community College (October 2015) and Pulse Orlando (June 2016) — the death toll rises to 163 and the number of injured far exceeds 200. In all of these attacks — as in the film Praesidium — gun-free policies simply ensured that the gunman’s victims could not defend themselves.